Many months ago, one of the highly-respected denizens of the KelbyOne Community had commented that my photos appeared too dark to him. He uses a calibrated monitor and definitely knows his stuff. Although I have a Datacolor Spyder Elite calibrator, I found that getting my monitors set properly was a real challenge. With my new monitor calibrated, I could finally see his point. What a massive difference! With that in mind, I wanted to re-edit some of the photos that I took at Photoshop World 2018 this year. 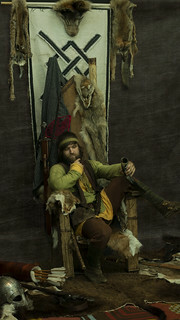 The fabulous Wyrd Brothers Productions had an excellent live model Viking set. I could finally do some justice to those images. I really like the intense stare in this newer version of the photo. Filter Forge helped me create a suitable background replacement. This image is a new upload to my Flickr Photoshop World 2018 album. I kept the same background replacement texture and made good use of the Topaz Labs toolset to tweak the colours and sharpening. 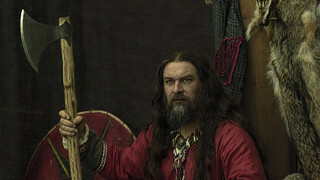 The three original images of the Vikings were cleaned-up and improved and two new images were added. My hope is that Wyrd Brothers return to Photoshop World 2019. I’ll be sure to take more photos this time and pay more attention to the camera settings. I don’t want to waste creative opportunities like these in the future.